We kicked off this series with an explanation of what an ALT actually is, and how it differed from an ELT. We later explained your role in school. This time, we'll have a detailed look at the average school day for an ALT. Working in school can be very easy for some people, and very busy for others. It depends on your teachers and your ability/how well you apply yourself. If you are good at coming up with/using ideas, then preparation will not be such a big deal to you. Some people will struggle at first. Everyone will have times when they have been asked to create something for a grammar point which just has no inspiring aspect; it will seem like there's no possible solution. That's life! We'll talk about the creative process another time. You will most likely not teach in every period. The average of most ALTs in my area is 3 per day, while I have slightly less and my girlfriend has a consistent 4. You are required to be on site for the whole day even if you have zero lessons, which you sometimes will (test days, etc). Sometimes you will need that space for preparation, but most often you will have a lot of free time to spend as you please (like writing a blog, for instance). 8:05: A teacher asks me if I have any ideas for third period. Luckily I have taught this particular grammar point very recently and have an activity I am comfortable with. 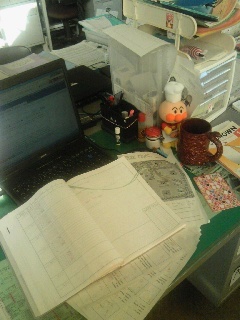 8:10: Another teacher asks me what I have prepared for 2nd period (she asked me to come up with something yesterday). I tell her. Everyone is happy. 8:12-9:35: I photocopy for 3rd period, make sure I'm confident explaining my game for 2nd period, and use my free time to plan this blog. 9:35: I teach a great class of 3rd graders to use "Why don't we.." (I lead the whole class). They come out with some funny stuff like "Why don't we build a love house?" "Why don't we make children?" and "Why don't we find beautiful women?". I also think a girl propositions me, but it might be lost in translation: "Why don't we do." 10:35-10:45: Break. Talk with the previous teacher about the good lesson, and the next teacher about the next class plan. 10:45-11:35: Teach the 2nd graders (my part lasts all lesson), where we study comparatives and superlatives with what turns out to be a too difficult sheet. That is my fault, as I need to keep tighter track of which classes are at what level. I've done the sheet before with a different class who did manage it, but these kids fail miserably. 11:55-12noon: Mark a diary that one girl gives me every day. Today it is very sad; about visiting her friend in hospital, and JHS coming to an end. Touching stuff. 12noon-12:45: Speak to the teacher for 5th period, who cancels it and asks me to come to his class in 6th period instead. Come up with something quick for that class. Write some blog material. 12:45-1:10: Lunch. Rice, sukiyaki, chikuwa and pickled veg. 1:10-1:55: Speak to teacher about my activity for 6th period. Have to totally change it for his low-level class (I had hurriedly found a sheet online earlier), which took maybe 20 minutes. Photocopy it. 2:30-3:25: Teach period six. It's mostly the JTE that teaches, while I help the kids, provide examples for things and think up true or false questions for the text. I do my sheet at the end, which isn't a huge success, but what can you expect from a grammar point as dull as "as cold as a fridge"? 3:30-350: Cleaning time. Clean the staffroom with the same good-for-nothing students as the last few months. I have to drag them around and demand they do a proper job. 3:50-4:15: Check email, finish this blog, etc. Go home. Today was pretty typical in that my role in class was pretty large sometimes, and pretty much the backseat the rest of the time. The cancelling and moving around of classes is also pretty typical, as is the workload and short-notice to come up with lesson material. You will also notice that some lessons will go very well, leaving you feeling great about yourself; and some will bomb completely and make you feel awful. This is often completely unpredictable. That's life! Well, that's it! Time to go home. Stay tuned for further entries in this series. Hi, I have some intermediate Japanese skills and am looking at becoming an ALT; do you know how this might affect communication with teachers? Students? In general you are not required to speak any Japanese at all in the workplace. Being able to do so will increase your chances of making friends of colleagues and make your student communication a lot easier. Certainly a bonus. So that is what you do all day! My day is pretty different to that. Any free time I have is spent marking books or preparing for future lessons (or my SEN class which I teach and plan for alone). I might have free time on Fridays (if I don't have the next weeks schedule) or after 3pm I have free time which is spent photocopying or more planning or, if I am lucky, studying. It would be interesting to hear about a day in the life of other ATL's. If you speak some Japanese, I think it will improve your lesson planning chats with coworkers. However, the biggest perk is that you can speak to other teachers outside of the English department, who tend to be happily surprised to be able to communicate with a foreigner and are really helpful in explaining daily events or where to find things. Even though they've had dozens of ALT coworkers, they may have never spoken to one. Regarding students, speaking Japanese helps you to understand their comments during class and in the hall. And, understanding how the language works gives you more perspective on the way they perceive English. I think you can teach and build good student relationships with or without Japanese, though. This is so amazing and helpful, you have no idea! It's nice knowing a bit of what is to be expected.